Look at the Image above what does it remind you of, days gone by that your grandparents and parents if your my age told you about, to me it signifies quality and the North East at its best. When Samuel Smith O.B.E. began trading as a tea merchant in Newcastle upon Tyne in 1907, he was not to know that one day his Company and its delivery vehicles would be a familiar feature in countless cities, towns and villages stretching from Edinburgh to Peterborough. Now, 105 years after Sam Smith began his business, we continue to deliver door-to-door to over 280,000 customers throughout the UK, and many more worldwide via our online store. We also provide the nations’ superior cafes, restaurants, hotels and workplaces with the best tea and coffee via our successful wholesale division, Ringtons Beverages. If, like us, all this talk of tea has made you thirsty, why not pop the kettle on and drink to another successful hundred years of Ringtons! I look forward to my fortnightly delivery of quality tea, coffee biscuits, banter and much more from the friendly staff who work for this fab company, sadly not delivered with a horse anymore but a small van in the same livery that has made Ringtons a great household name. The perfect gift for Ringtons and memorabilia fans, our latest 1907 gift box brings together our highly collectable 1907 fine bone china beaker and matching tea caddy. The 1907 tea caddy with detachable lid is matt cream with gold gloss, while the matt cream beaker features 22 carat gold detailing. Both the caddy and the fine bone china beaker celebrate our rich heritage and feature our much-loved horse and cart, the original RT crest and the iconic Ringtons building on Algernon Road in Newcastle. 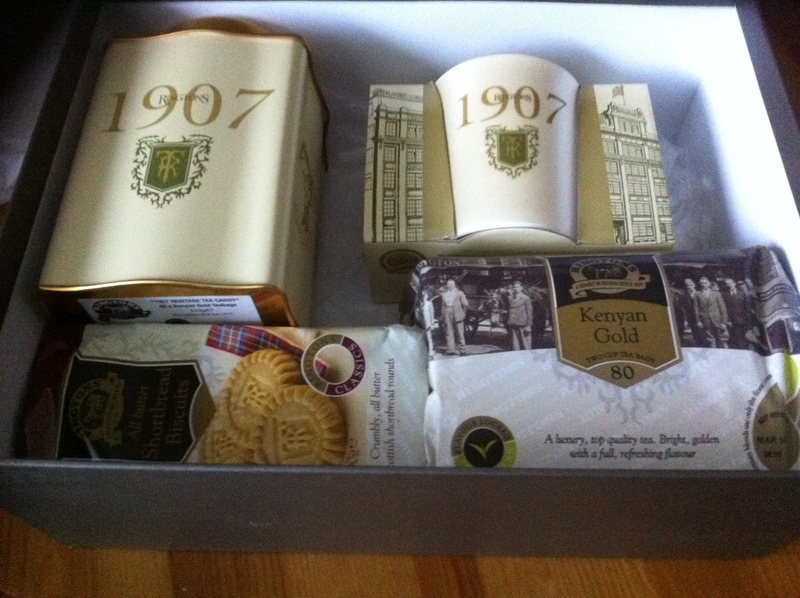 This beautiful gift box also contains All-Butter shortbread Rounds and 80 Kenyan gold.